People call the T25/T3 Synchro the most compact 4×4 camper out there, but the T25 is still a cramper like any other VW bus. Enter the LT, and in it’s 4×4 guise it’s one of the trustiest expedition vehicles out there. 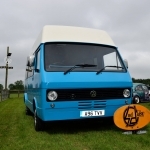 The Mk1 VW LT was the big brother to the VW Transporter T3/Vanagon. It came in a gross weight load rating from 2.8 tonne to 5.5 tonne (that’s what the number behind the LT indicates). 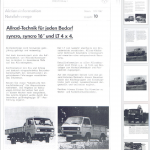 All 4×4 LT’s were either LT40 or LT45, so rated for 4 or 4.5 tonne. 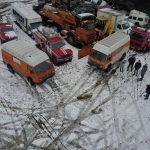 There were also non 4×4 LT40 and LT45. They were build from 1975 (4 years before the launch of the T3) until 1996 and that’s where the original D24 and D24T engine comes from. 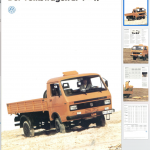 From 1975 to 1977, the diesel LT’s had a 2.7l Perkins engine. The petrol ones were a 2l Audi inline-4. This was replaced in 1978 with the D24. In 1982, the D24T then was introduced together with a massive facelift (mostly interior and engines) of the LT and the introduction of the 2.4l inline-6 petrol also. Volvo made a deal with VW for that engine to go into the Volvo 260, 740, 760, 940 and 960 as their diesel offering. They also agreed with VW, that VW never would use that engine in a car, so that the Volvo would be the only car with that engine. If you ever open the bonnet of your Volvo, you’ll see, that a lot of parts are badged VW/Audi. That’s because it’s a VW engine in the Volvo. 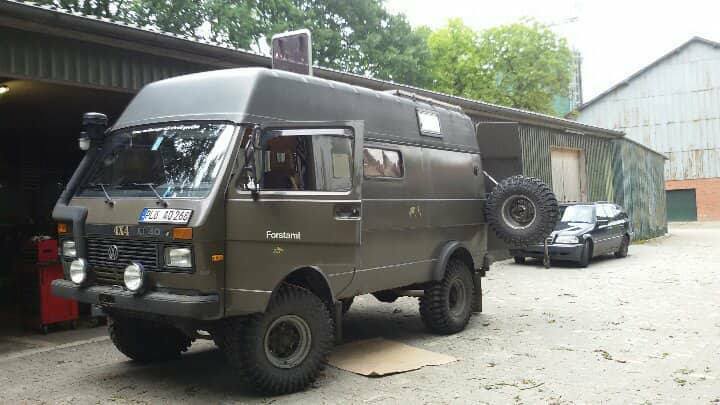 Other vehicles with that engine are for example the Pinzgauer. 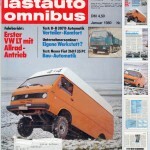 VW LT’s were also build on license or rebadged in Spain by Pegaso and named Pegaso Ekus. 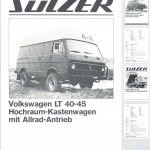 The 4×4 variant (like mine) of the VW LT were originally developed by a company called Sülzer who build the first (I think 156) 4×4 VW LT’s. All which had the 6-cyl petrol engine. The drivetrain and chassis is based on a normal LT40 or LT45 with leaf springs front and back. The chassis is lifted, 26mm anti-rollbars are added to cope with body-roll and the axles are replaced. A transfer box from New Process was installed in the drivetrain, which is propshaft-driven and cable-operated. The same transfer box can also be found in Chevy Blazer and Jeep Cherokees. The axles were replaced. The first 6 Sülzer LT’s had Dana axles, then production was changed to axles from the Italian company Clark-Hurth. All 4×4 LT’s came with rear and center diff-lock standard, front diff-lock optional. From 1991 and on, front diff-lock also was standard. 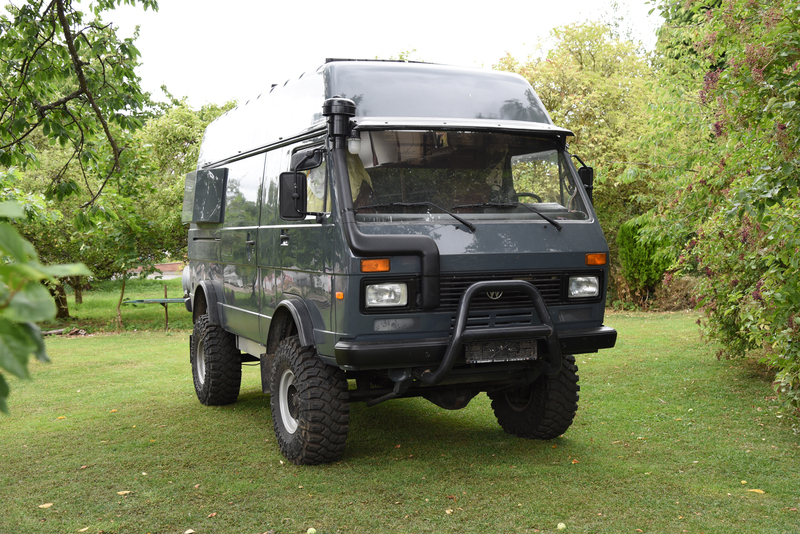 The D24 option was soon dropped, as it didn’t have enough power for the 4×4 drivetrain. So most 4×4 LT’s are either the 90 bhp 6-cyl petrol or the 102 bhp 6-cyl D24T. From 1993 then, VW introduced the D24TIC with 95 bhp, but more torque, for the LT (and LT 4×4). 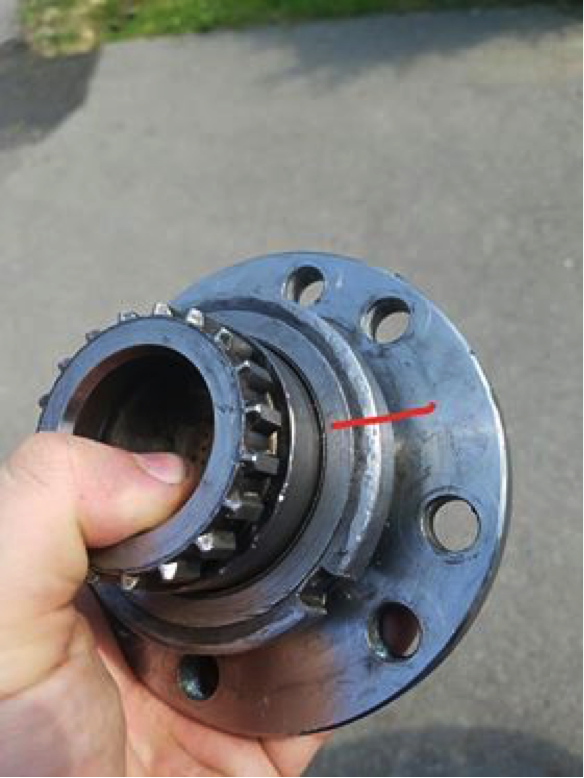 The later ACL engine allows a comfortable top speed of between 90 – 100 kph at 3,000rpm due to the preference of higher torque further down the rev range to improve off-road and load carrying performance. 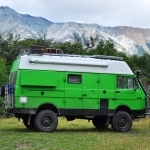 For many this is a limitation when it comes to converting vehicles to use as campers. It is possible to swap in an engine from a Volvo 960. The D24TiC Volvo and the ACL are the same, but Volvo has more boost and the turbo kicks in earlier, with a more aggressive cam. You’d also need to fit a few parts from the original engine for the swap over – the injection pump is difficult to adapt. Some drive in permanent 4WD to spread the wear between the axles. The 208 transfer case was fitted to pre-facelift 4×4 LTs. It had straight cut gears and was really noisy. The advantage of swapping over to the newer 242 is the open 4WD. In the 208/241 the centre is locking in all 4WD settings so it’s not recommended for good roads in good weather. There is no issue with ground clearance as the diffs of the axles are lower than the t-case. 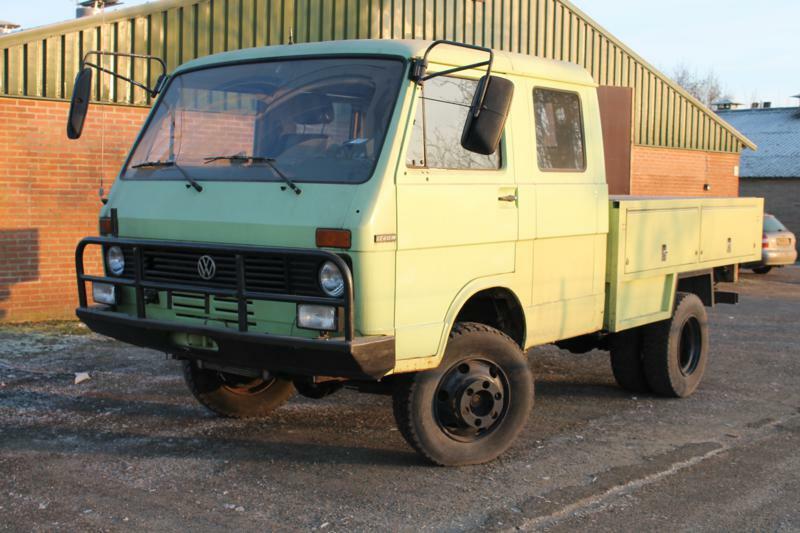 At the end of the day, there’s about 5 million Mk1 VW LT’s build, where the majority have the D24 or the D24T engine. Out of these, there’s only 1250 4×4 LT’s build from around 1982 and onwards. 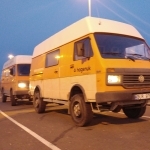 In 1996 the Mk2 LT was introduced, which shares the body with the Mercedes Sprinter, but has the 2.5 TDI engine, that also is in the VW EuroVan (or T4 as we call it in Europe). That same engine also sits in the Volvo 850 TDI’s. The current successor of the VW LT is called VW Crafter and is as of 2 years ago also officially available in a 4×4 variant. 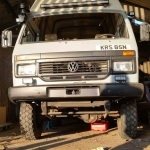 One of the most well known VW LT 4×4’s on the planet right now is the overland junkies bus first imported by Nigel Sutterby into the UK and now heading south through the USA. Below is their video of their conversion. Hello. 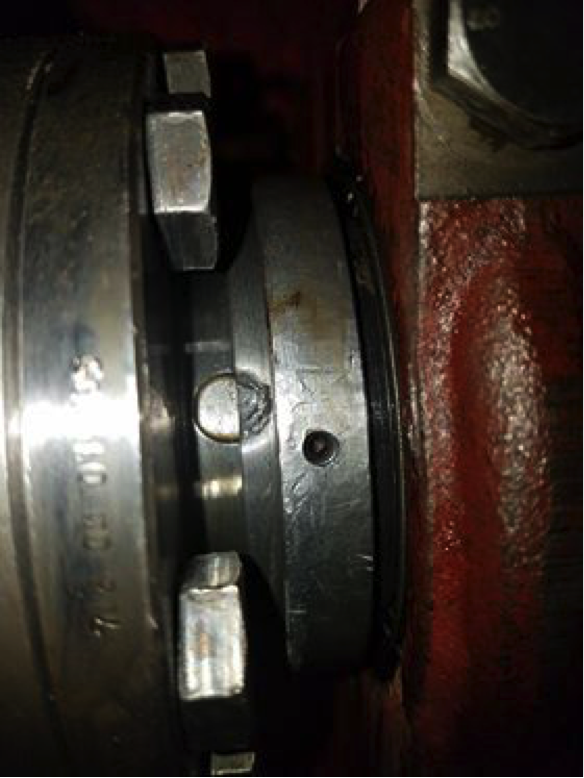 Can you help me with OEM codes or dimensions for all 3 cardan shafts for an LT40 4×4 box body ?